Brendan Fraser and friends climb deep down into the core of our planet to explore in "Journey to the Center of the Earth," a new 3-D adventure hitting theaters this weekend. NORTH AMERICA, April 10, A. D. 1818. "I declare the earth is hollow and habitable within; containing a number of solid concentrick spheres, one within the other, and that it is open at the poles 12 or 16 degrees; I pledge my life in support of this truth, and am ready to explore the hollow, if the world will support and aid me in the undertaking. ... I have ready for the press, a Treatise on the Principles of Matter, wherein I show proofs of the above positions, account for various phenomena, and disclose Doctor Darwin's Golden Secret. I ask one hundred brave companions, well equipped, to start from Siberia in the fall season, with Reindeer and slays, on the ice of the frozen sea: I engage we find a warm and rich land, stocked with thrifty vegetables and animals if not men, on reaching one degree northward of latitude 82; we will return in the succeeding spring ..." -- Jno. Cleves Symmes, Of Ohio, Late Captain of Infantry. Symmes wasn't kidding. He managed to get American congressmen to vote on funding this expedition. Alas, the vote failed, and Symmes' theory wasn't disproved. It even amped up the imagination of Joseph Smith, who, in his Mormon revelatories, claimed the Lost Tribes would eventually chip through the ice barriers and descend from the northern lip of the 4,000-mile hole that was the North Pole. Well, OK. The notion of a hollow earth finds adherents even today -- some Nazis even believed we live on the INSIDE of a sphere, in a convex world, which explains why their radars were pointed the wrong way -- but mostly, a hollow earth is the stuff of rollicking fiction, a way of visiting a new world without leaving this one. Admit it, Symmes' actual manifesto above reads like the beginning of an old-fashioned adventure story, doesn't it? Although there have been any number of hollow-earth novels -- Edgar Rice Burroughs' Pellucidar series having pride of place -- Jules Verne's 1864 "A Journey to the Center of the Earth" is the classic, and even today it's hard to put down. Oddly, it was pretty much ignored by filmmakers until the operatic 1959 edition (James Mason and Pat Boone! ), but thereafter, a quick scan of IMDB reveals that new film adaptations come along every few years. This is the latest, and certainly the most ambitious, since 1959. 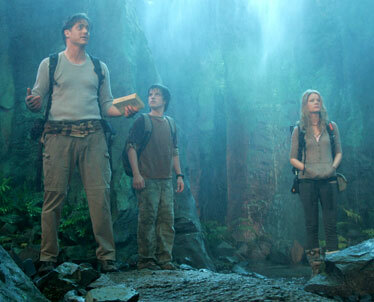 It's a simple, family-oriented thrill ride, with the added oomph of 3-D technology (the inherent dimness of the effect works well in caves, low overhangs and deep pits), made tolerable by the presence of Brendan Fraser, who is simply brilliant at essaying heroic lugs. Fraser's physical dexterity and comic timing are laid out in good order here, and "Journey" is pretty much a Frasermobile. Without him, it just doesn't go anywhere. Plot: Instead of being based ON Verne's novel, the new film is ABOUT Verne's novel. Fraser is a geology professor who's a "Vernist," that is, someone who believes Verne's fiction is actually disguised fact. When he acquires a paperback copy of the book with crib notes in the margins, it's enough to set him off the Iceland to hurl himself down a volcanic tube. Along for the descent are Josh Hutcherson, a bratty nephew, and Icelandic guide Anita Briem, your basic Nordic goddess. The three of them go from here to there, with stuff happening in between, and they come out in Italy, just like the book. The stuff in between is simply thrill-park effects, and while it doesn't make literary or scientific sense, it does satisfy your sense of adventure.